Are you looking for an entertaining app for your device? Do you want to play with your photos and create new, more interesting ones? If you do, we have an awesome app to present to you today. It is called SwapMe and we discovered it when searching through the Photo & Video category on the App Store. 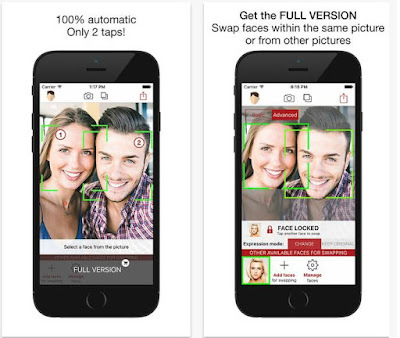 The app is created by Faciometrics and designed for both iPhone and iPad. The intuitive and friendly user interface allows you to use it with an ease and quickly figure out how everything is working. The SwapMe app uses facial feature detection, gaze tracking, head pose estimation and engagement and attention estimation. With it, you can have fun swapping faces within the pictures you upload. Just upload your photo for editing or take a selfie with your friends and swap the faces. Try to make your face more visible, by putting away your glasses or your hair that may affect the final result. The pictures are with high quality and show great results. The SwapMe app has incredible in-app purchase for you enjoy the advance mode to preserve the expression. Save your masterpiece, assign it to a contact or just simply share it with your friends and family via email or any social media. Download the app for free from the App Store.